Christmas Gifts + Ideas From RedBalloon Are Perfect For Everyone! For Christmas gifts that are perfect for everyone, you've come to the right place. With our range of experiences you'll find christmas presents that will create memorable moments, making them the perfect xmas gifts for mum, dad, kids and everyone special in your life. Shop our range of Christmas gifts 2019 and find everything from personalised gifts to unique experiences that will guarantee this is best xmas yet! The festive season is well and truly upon us so it’s time to start thinking about all the Christmas gifts you are going to need to buy for the special people in your life. It can be hard thinking of original, fun and special xmas presents for everyone which is why we’ve taken away the stress of having to shop for all your loved ones with our curated range of gifts. Whether you’re after gifts for mum, dad, kids, partners, friends and everyone in between we’ve got something for them. If you’re looking for christmas gift ideas that are outside the box and will be an experience they’ve never tried before, you’ve come to the right place. What are some of the best Christmas gift ideas 2019? Nail your gift giving this year with an experience from RedBalloon. Send them sky high with a skydive over the beach for the ultimate bucket list present. This is the perfect present whether you’re looking for gifts for dad, mum or a loved one who considers themselves an adrenaline junkie or better yet, wants to conquer their fear of heights. If you’re looking for Christmas gifts 2019 that will blow them away and score you extra brownie points as the world’s best gift giver, why not spoil them to a getaway. These are perfect gifts for men and women in your life that are in need of a little escape or some well-deserved time off. From an overnight stay in the Yarra Valley for 2 to glamping in Jervis Bay, you’ll find an experience to suit their needs. 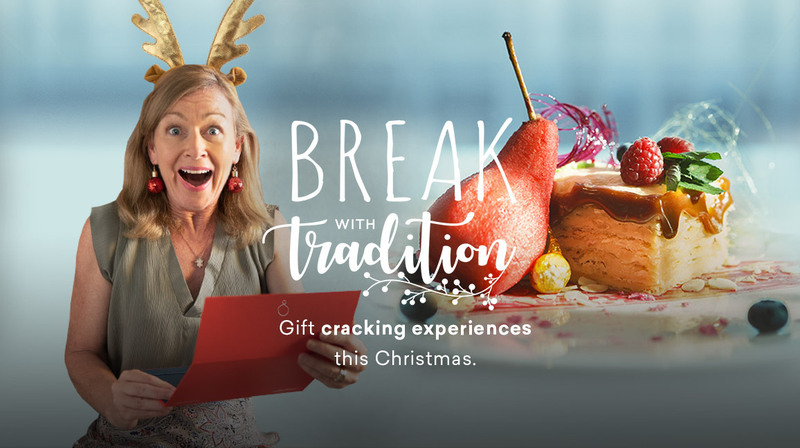 If you’re looking for gifts for parents, why not team up with your siblings and treat them to a romantic getaway that we guarantee will go down as one of the most thoughtful and special christmas gifts they’ve ever received. What are some unique Christmas gifts? It can be hard coming up with thoughtful and unique christmas gift ideas year after year. With our diverse range of experiences and gifts and hampers, you’ll find the perfect gift that is memorable and sure to impress the lucky recipient. Some of our favourite unique christmas gifts include hot air ballooning, cooking classes, cruises, personalised gifts and V8 car racing to name a few. Anyone can give a traditional present like a jumper or pair of socks but there is nothing more special than a unique experience they have never done before or always wanted to try. We offer a range of bucket list worthy experiences you have to try at least once in your life along with gifts that will surprise and delight with the thought that has gone into it. To top off your gift, you can even add a personalised message when you purchase the experience voucher or gift product to go that extra mile. What are the best last minute Christmas gifts? It can be hard finding time to go shopping for all your christmas presents, especially if you have plenty of people to buy for and you’ve left it to the last minute. At RedBalloon we take the stress out of finding your xmas gifts as all you need to do is choose the experience online and your present is ready… no need to spend hours looking around the shops, standing in queues or getting stuck for ideas whilst in a busy mall. The best part about our last minute Christmas gifts is that they are ready instantly thanks to our evouchers which means you can even buy them on Christmas Day… now that is seriously last minute. However please note that our Christmas hampers and products that have to be sent in the post have certain delivery cut off dates, please refer to each product for information. Whether you’re looking for personalised gifts or fun experiences, we’ve got something for every personality type that are the perfect go to gifts if you haven’t even started your shopping yet. If you’re looking for christmas present ideas that are guaranteed to be a huge success, high tea, quad biking, shark diving and glamping are just a few ideas of amazing gifts that will surprise on Christmas day 2019. You’ll find last minute ideas that will make perfect gifts for couples, gifts for her, him, family, friends and everyone in between. If you’re still stuck for ideas and running out of time, why not give a RedBalloon gift voucher and let them choose from over 5000+ experiences as well as our range of gifts and hampers. They will appreciate the gift of choice and will be spoilt with all the options available. What other types of Christmas gifts does RedBalloon offer? Not only does RedBalloon offer an amazing range of gift ideas for parents, men, women, kids, families, couples and more, but you can also find great ideas for other gift-giving needs during the holiday period. If you are looking for fun and different kris kringle or secret santa ideas, we’ve got the perfect range of experiences and products. You’ll take your gift giving to the next level when you give an experience rather than a typical present like a candle. With experiences like scenic cruises, paintballing, treetop adventures and virtual reality all under $50 you’ll wonder why you hadn’t gifted one sooner. We also have a great range of christmas gifts under $100 and under $50 which are perfect if you’re looking for thoughtful present ideas that won’t break the bank. With the variety of experiences on offer you’ll be surprised to find them so well priced. RedBalloon also offer an amazing range of experiences for 2 which is the perfect opportunity to gift a present that allows two people to spend some quality time together. These are the perfect go to gifts for couples, parents, your loved one or even a friend you want to enjoy an experience with. From restaurant experiences to getaways and hot air ballooning to go karting, you’ll find a variety of gifts for 2 that are double the fun. Make sure you have our look at our cracking Christmas Deals on offer this year. You can enjoy up to 50% off selected experiences, saving you big time on cracking experiences. Keep an eye out for a flash sales in the lead up to Christmas to score an even bigger discount on your gifts. With Christmas 2019 fast approaching don’t be stuck for gift ideas again thanks to our range of experiences perfect for everyone. Sit back, relax and wait for Santa knowing the stress of finding unique and thoughtful gifts has been taken care of thanks to RedBalloon.